So I'm sitting at home brainstorming some more fancy cinematic feasts that this blog could ruminate over, and I thought I'd love to chat about some of my favorite performances and actors. I'm in fact stealing this idea wholesale from Nathaniel at The Film Experience, my favorite movie blog. Every Monday I'll highlight a movie monologue I've found particularly insightful, brilliant and/or historical. "It's a reason to smile." 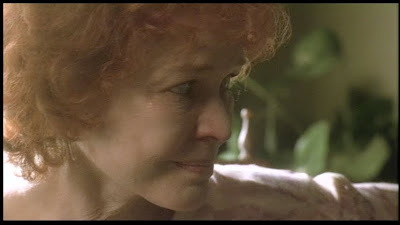 Flipping through Ellen Burstyn's autobiography in a bookstore one day, I read that while she didn't mind losing the Oscar to Julia Roberts in 2000, she did say something to the effect of "everyone knows I should have won, but whatever." Ha! It's maybe true. Ultimately, Julia Roberts didn't really need an Oscar to further her career, but Ellen (who already had one for 1974's Alice Doesn't Live Here Anymore) could have used another to bump her late career into another level. She's been busy this past decade but not nearly busy enough -- her biggest movies were probably W. (as Barbara Bush), The Fountain, and the flop remake of The Wicker Man. 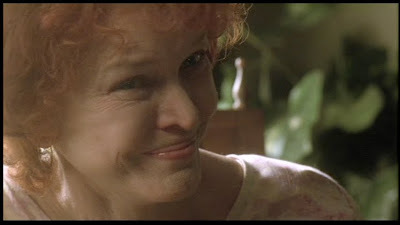 Nothing even holds a candle to her historical performance in Requiem for a Dream. 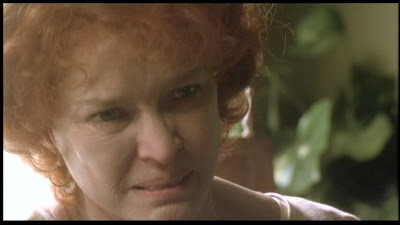 On paper, it'd be easy for this to be a terrible monologue -- the stream of thought is all over the place -- but Burstyn's delivery is layered, connected and yet erratic like an addict. The camera is relentlessly close to her face, showing every wrinkle and stress line. "They don't need me!" No one needs Sara Goldfarb anymore, not even her one remaining blood relative, her son Harry. All she has now is a goal, an obsession, and while she knows it's ridiculous, it's too much to admit that it isn't working. She can barely say "I like the way I feel." Burstyn delivers the line like she's mustering every once of energy to believe it. By the end of the monologue ("Now when I get the sun, I smile. "), she's put on a brave face for too long, and we haven't left her face for the entire speech more than once, briefly to show Harry's reaction. The camera still stays on her, for an almost uncomfortable last moment, and she looks around, desperately looking for an escape. A beautiful performance. What other moments in Requiem strike you as particularly memorable, ten years later? My memories are somewhat cliché: the repeated staccato cuts every time one of the addicts gets their fix, the desperate descent into hell they all go through at the end (especially the split-screen). Harry's visions of Marion standing at the end of a pier stick out, too, if only because there were near-identical shots, also in a character's mind's eye, of Jennifer Connolly at the end of a pier in Dark City. My brother tipped me off to your blog, Max, and I'm really enjoying it so far!